Field bins ranging from 39m3 (360 bags) to 48m3 (440 bags) are available from Ahrens Sherwell range. These bins are designed to make the harvesting process run smoothly and have the flexibility of being positioned wherever needed. The bins can be operated by a single person and have been manufactured to a design that is tried and tested by Australian farmers over the years. 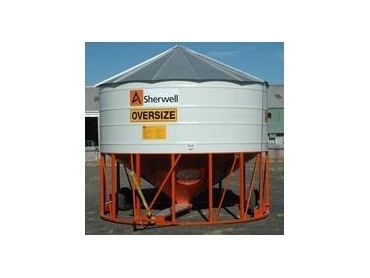 PTO field bins are available in two sizes, 39m3 or 48m3 and via the in-built PTO driven auger grain is discharged. The PTO field bin also has an interior choke fitted and the heigt clearance under the auger outlet is roughly 3.96m. The gravity fed bins are also available in the same sizes and the models 35 degree cone angles to ensure that the bin fills and empties completely. With a trapdoor that is externally controlled, grain flow can be regulated. By feeding to a removable discharge hopper, the gravity fed bin can be used with a portable auger.